Established by the Poole brothers in the 1760s, Poolesville grew from one log store into a small community that became an incorporated settlement in 1867. Poolesville was a Union town during the Civil War and Confederate troops staged several unsuccessful raids there. Although no battles were fought in the town the Battle of Ball’s Bluff was fought nearby and the remains of several troops are still at rest in the old Poolesville Methodist Cemetery. Today, Poolesville has an active historical interest led by the Historic Medley District. Many structures and landmarks have been preserved and are open for public use. 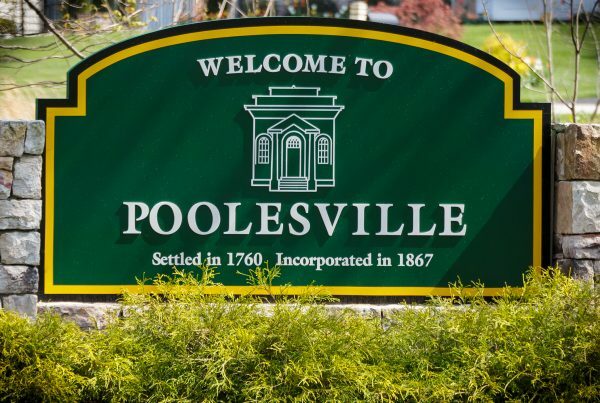 With a population approaching 5,000 and located in Montgomery County, Poolesville has become an active town that appeals to area commuters into Washington, D.C.